ROSAMOND – A 9-year-old Rosamond boy who allegedly said “time to die” and charged a deputy while armed with two kitchen knives was placed on a 72-hour mental health hold, authorities said. In the early morning hours of Tuesday, October 15, two deputies from the Kern County Sheriff’s Office Rosamond substation responded to a call of a “911” hangup in the 3300 block of Rosegold Avenue, in Rosamond. Upon arrival, deputies spoke with a male subject who said his nine-year-old son was having a mental episode and was armed with kitchen knives. The man escorted the deputies into the home. 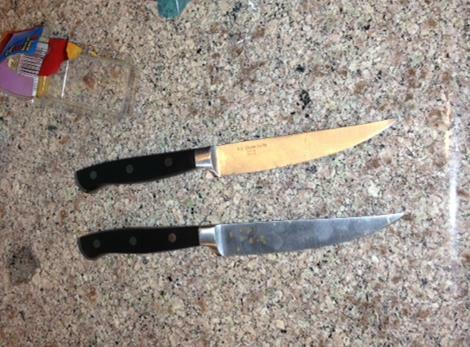 They were confronted in the living room of the home by the nine-year-old juvenile who was armed with two large kitchen knives. 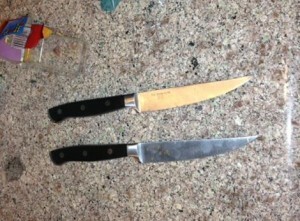 The juvenile was waving the knives and threatening to stab his mother, who was also in the living room. The juvenile lunged with the knives in a threatening manner toward his mother but then turned and ran at one of the deputies, who was yelling for the juvenile to stop. The deputy stepped back behind a couch sectional as the juvenile ran at him. The juvenile jumped on top of the couch and stopped with the knives raised. The juvenile retreated back onto another section of the couch. The juvenile continued to make threats to stab the deputies and made a statement that it was “time to die”. The deputies slowly advanced on the juvenile and sprayed a burst of pepper spray onto his face and eyes. The juvenile tried covering his face and head using his hands and the knives to block the pepper spray stream. Shortly after the pepper stream hit the juvenile’s face, he dropped the knives and went to the ground as the pepper spray took effect. The deputies were able to take the juvenile into custody without further incident. The juvenile was transported to a medical facility in Bakersfield where a 72 hour mental evaluation hold was placed on him. 19 comments for "Knife-wielding child taken into custody"
Rose, that is the most ignorant comment I have ever read. He was a 9 year old boy. I don’t remember any cops ever shooting a 9 year old boy armed with a knife, gun (toy or otherwise) maybe, besides what does his race have to do with it? Are you saying all black and hispanic 9 year old boys armed with a weapon are going to automatically be shot due to their race? Please, we have enough problems with people yelling racism..
I’m assuming the kid is white because any other race probably would have been shot or handled very rough. But I hope he gets help because these parents might be raising a Jeffrey Dahmer or Ted Bundy!! A 9 YEAR OLD BOY KERN COUNTY BOY IS BEING HELD IN A JUVENILE PSYCH WARD AFTER A RUN-IN WITH THE COPS. KERN COUNTY SHERIFFS DEPUTIES SAY THE CHILD WAS ARMED WITH TWO LARGE KITCHEN KNIVES AND THREATENING TO STAB HIS MOTHER TUESDAY. DEPUTIES SAY HE ALSO TRIED TO ATTACK THEM AFTER ARRIVING AT THE HOME IN ROSAMOND. THEY PEPPER-SPRAYED THE BOY AND TOOK HIM INTO CUSTODY. DEPUTIES SAY THE BOY KEPT SAYING “IT’S TIME TO DIE” AS HE SWUNG THE WEAPONS AT THEM. A juvenile can be held for more then 72, the initial 72 is the police departments initial detainment, then the juvenile can be held over 30 days unlike an adult that has to be held after a doctor evaluates… Juveniles are easier to hold….. But they won’t be gone for to long… The kid that brought a chamber with full mag .45 to the school Desert Pathways last spring has already been released and tried to reenroll….. Mental health kids get all the breaks…. Have mental illness is like getting a special pass to cause chaos in society….. Every year I have worked in the field it has slowley but steadily gotten worse…. 72 hour mental evaluation hold isn’t enough for someone in this mental state regardless of age. Wow, Im just glad this didn’t turn into a crime scene! Everyone was lucky in this situation in the fact that no one got seriously hurt or killed. I hope the boy and his family seek counseling and that this youth can be helped. I know this is bad, but was the child’s name “Chucky”? WHERE ARE THE PARENTS AT??????? If you read the story, you would know the answer to your question. Lol.. His/her mind must have been wondering while reading! I think you need to re-read the article…both were there…R E A D….. This is sad to hear…Hope the boy gets the help he needs and the parents receive help and information so the whole family can be helped. This is so sad. Poor boy and poor parents. I hope they all get the help they need. The story says that his parents were in Hawaii sipping on a piña colada while all this was going on. Good grief, he’s so young. I hope these parents don’t let him have these horrendous video games. I hope they find out what’s wrong with him. Poor baby! Yes, video games could be the blame. Look at all the problems teachers and parents are having with young kids. There has always been some form of violence, but things have gotten so much worse since so many kids are playing violent video games for hours. I’m sure there are plenty of studies that support your opinion Gemini. I think j is just looking for a fight. Explain gladiator fights during the Roman era. They loved violence but never saw a video game in their life. Ha ha, that made me almost spit out my drink…. Amazing how my son has played violent video games for ever and knows it is entertainment….. Blaming a video game is just a lawyer approach to defend a felon….. I hope this family gets the help it needs with this young man. So many kids are out of control and not afraid of anyone or anything.